This is the reality of the street, bloody and violent. However, when police advocate “violence of action” on citizens, the response is like the lady in the bottom right (photo from YouTube). Let me be sure here, I am talking about using the phrase “speed, surprise, and violence of action” as a standard training model and mantra for structural entries on warrant services or barricaded subjects. I am NOT advocating officers reduce the tactics, and procedures to keep them safe when force is needed to stop a violent or resistive threat. The most common time we hear this training concept is in the application of entry techniques. Though the concept is found in both during SWAT and Patrol doctrines, it has been much more widely spread in the tactical arena. In these actions the intended purpose is to secure and apprehend the suspects as quickly as possible to secure the scene, protect all those involved, and allow investigators to come in and collect the evidence. Innocent until proven guilty is one of the foundations embedded in our system of justice, and the people expect us to respect that – even on high risk warrant services or armed barricades. It is understood there are bad people out there, and those who pay no attention to the rules of society, but the law and the people do not want us to become the judges. Using “Violence of Action” brings these types of images in the minds of the public, juries, and judges (photo from the movie Platoon). Using the phrase “Violence of Action” is just asking to be crucified in court, in the public’s eye, and likely by your own Command Staff. This is regardless of how justified our actions may have been. The phrase makes it appear we are pre-programing ourselves to commit violence on the citizens (even if they are criminals). It is simply the next step in the (3) step process – speed, surprise, and then violence of action. behavior involving physical force intended to hurt, damage, or kill someone or something. the unlawful exercise of physical force or intimidation by the exhibition of such force. Neither of those definitions are something an officer, team, or department should want associated to their actions. Can you imagine what this would sound like in the press or in court? You can try to justify it, you can try some fancy way of explaining this, but in the end “violence” sounds pre-meditated, and pre-determined to do harm. Your explanations will only come across as pandering, or worse, attempting to hide the facts. If you train to do “violence” as a standard element of training, and then you commit violence in the course of your actions on an actual event, there is a casual element that even a freshman attorney can paint for a judge or jury. It won’t be too much of a stretch to believe the attorney’s presentation – “you were taught to commit violence as a standard operating procedure, you were trained to commit violence during numerous and repetitive training cycles, and when you went into my client’s house/room you were pre-programmed and pre-determined to deliver violence upon my client … regardless of an actual threat or resistance“. The results of hammering flawed terminology into our officers are the horrific headlights involving unarmed and sometimes innocent citizens being killed or seriously injured. Those actions fuel the fire against the police in general, and especially against SWAT teams. When a team limits their training and operational options they become a hammer, and everything looks like the nail. Do you think this is all wrong? Do you think that very scenario does not happen across the country? Do you think I’m caving to political correctness, and hindering officer safety? Well, let me be frank then – If you don’t think this is a problem, then you are dead wrong! Every tactical team is made up of individuals. Though we preach and train to work as a unit (a Team), the team (whether SWAT, Detectives, or Patrol) will always operate to the capabilities of the individuals making up that team. Team performance is limited to the skill level and experience of the individual team members (photo by funnyordie.com). When we look at our law enforcement teams the same is true. There are individuals, or small groups that perform really well. There are also individuals, and small groups that do not perform to the same level. In a highly dynamic event, we cannot always ensure that our best operators are going to be the ones to confront the challenge. Sometimes it falls to the operators way back in the stack, or on the perimeter, where officers with less experience are often placed. Unfortunately, in many cases even the “best” on the team are very limited in skills due to lack of training time, proper equipment, exposure to outside training concepts, and lack of experience in the wide range of actions a tactical team may face. 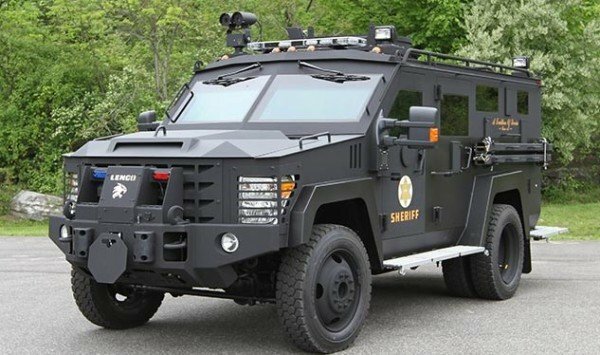 The vast majority of police SWAT teams are part-time. The team members perform full-time duties in Patrol, Investigations, or other areas, and then take on tactical duties as the need arises. Full-time teams are usually only found in the largest departments serving the most populated jurisdictions. 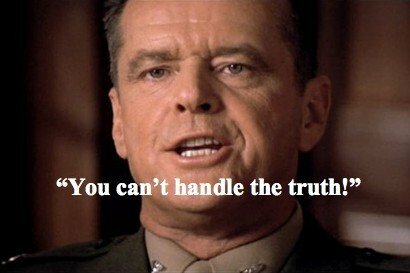 Col. Jessup nails it! Some teams just “can’t handle the truth” (photo by picmia.com). In those situations training often comes “in-house” and word-of-mouth, and is confined to the set of skills that particular team has adopted from years past – regardless of the validity of the procedures. This is where, “because that’s the way it’s always been done here” mindsets are formed. This can be extremely dangerous for the team and team members, both in the physical sense and in the legal arena. We must remember that this original concept (Speed, Surprise, and Violence of Action) was presented as a military training philosophy under combat conditions. The military trains to an entirely different mission and force parameters. During combat missions, deadly force is the expected course of action when confronted with resistance or opposition from an enemy. Law enforcement is not that way at all. On the contrary, police officers have the primary purpose of apprehending offenders and bringing them before a court, where a judge or jury decides justice. The level of force a law enforcement officer uses must be objectively reasonable based upon the totality of the circumstances and the level of violence or resistance being faced. Deadly force by a police officer is a last resort, when the threat being faced is dire with the potential of serious injury or death to the officer or others being high. When that level of resistance is faced, the use of deadly force is justified. The situation can build up to that, or it can be immediate, but in the end police use of force is judged on what was objectively reasonable at the time. 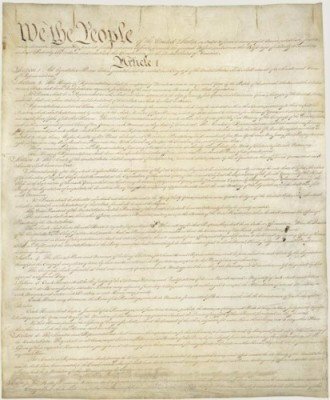 The Constitution of the United States (Courtesy of the Library of Congress). The 4th Amendment to the U.S. Constitution protects citizens from the government exercising “unreasonable searches and seizures“. We have talked in the past about how a previously lawful action can suddenly become unlawful due to the manner law enforcement carried out its function. Depending on the severity of the breach, courts have gone as far as barring evidence or confessions obtained against the suspect and in turn holding the officers and departments liable for violations against the suspect’s Constitutional rights. Every officer at one time or another swore an oath to uphold the Constitution, and its about time we evaluated our tactics, actions, and language to ensure we are doing just that. When officers execute a search warrant, that warrant allows entry to search and seize particular items. The Courts have also recognized the safety of officers entering someone’s residence allows them to temporarily detain, handcuff, and search persons inside of the location to be searched. However, a search warrant does not grant unfettered ability to use force, destroy property, or keep individuals handcuffed or in control positions for lengthy periods of time. The Supreme Court has recognized that without the most extreme dangers, officers must knock and announce their presence and purpose to allow the occupants to surrender the location peacefully. Though the U.S. Supreme Court has been extremely hesitant to lay a bright-line rule on how long officers must knock (a very wise decision), the Court did find 15-20 seconds to be reasonable in determining the case of U.S. v. Banks (2003). Police may now only search vehicles incident to arrest if they believe evidence of the crime arrested for is located inside (photo from YouTube). Motor vehicles are highly regulated by the State, unlike a person’s home. Persons have a much reduced claim of privacy in a motor vehicle as opposed to their home. Eight little words, “because the law says we can do it” changed 100 years of previous legal precedent. Courts can be very accommodating to officers when they present a reasonable and viable explanation of their needs or actions. However, Courts detest arrogance or ignorance in officers actions. 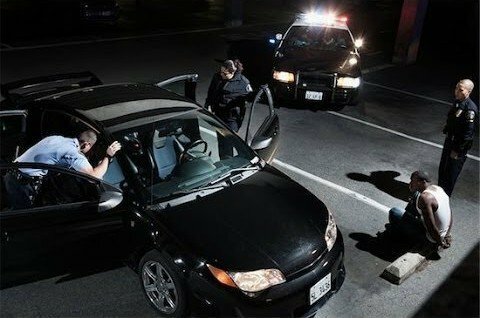 Telling the Court, “I did it because I can” was all that was needed to alter the course of motor vehicle searches. There was no articulation about motor vehicles being able to be removed from the jurisdiction. There was no mention of the intelligence about illegal drugs being distributed at the address. There was no mention of the concern about weapons or contraband in the vehicle. Any one of those explanations would have likely seen a much different finding in Gant. Instead, the officer’s response came across as arrogant or ignorant, and placed a dangerously cavalier attitude in the Court’s mind – officers are searching vehicles “just because I can“. This perfect combination was all the Supreme Court needed to dial police back a notch, and inevitably severely limited the scope of vehicular searches. This series of articles focuses on both the “search” and the “seizure” in relation to 4th Amendment protections. The method of the search must meet Constitutional standards, as well as the method of seizing the suspect. If officers are being trained that once the mission kicks of we are going to use “Speed, Surprise, and Violence of Action“, we are basically setting in motion a train without brakes. That train does not allow for discernment of the actual situation being faced, the only solution provided is “violence of action” against anyone who is confronted. The results have been horrific. The elderly thrown to the floor with guns pointed at their heads. Children held at gunpoint, while officers scream commands at them. Flash bangs deployed without sighted-delivery causing horrific injuries to innocent people, and in some cases igniting fires that destroy property. Doors and windows breached unnecessarily. Animals shot simply because they were present, not necessarily because they were attacking officers. We cannot continue to use this unjustifiable training concept that reinforces “violence of action” without any alternative options should the case warrant. Instead, we should begin to recognize there are better ways to convey the message and the tactics, without losing the valuable concepts that can keep officers and suspects alike safer during warrant services or barricade resolutions. It may seem rather simplistic to believe that a few simple words can alter the manner of our actions, but I believe it can set a tone from the first day of training all the way into the mission itself. Again, I am not advocating surrendering officer safety, but I am strongly recommending we alter our terminology and the intent of our tactical training. Instead of “Speed” being the go-to, catch-all training concept, we should teach and encourage our officers to “move with a purpose“. As mentioned in the first article, there are absolutely times when moving fast is appropriate. Clear thresholds and fatal funnels as quickly as you can. However, when an opportunity presents itself to reduce our speed, we should teach officers to slow enough to gain a better understanding of their surroundings and any threats, and recapture the OODA loop that is often lost during very fast movements. Do not underestimate the importance of conducting a proper threshold assessment. We teach Patrol officers all the time to “cut the pie” when working angles. Just because SWAT officers have heavy vests, armor plates, and helmets, does not mean the tactical principles change. Even high-speed, low-drag SWAT cops should be using very tactical tool in the bag to ensure their actions are right and safe. Charging into a 50/50 situation, or an ambush, is just stupid and reckless, unless it is a part of a hostage rescue that necessarily requires removing many safety precautions to try to save the hostage. Team Leaders have a duty and responsibility for their teammates. This includes making sure they are properly trained, properly equipped, and capable of performing to the highest levels. Team Leaders must leave their egos in the locker room, and perform a proper and objective evaluation of their team’s capabilities. If a situation arises that is beyond their set of skills, they cannot charge ahead to save face. Instead they must recognize the inherent dangers of taking on high-risk tactical maneuvers they are unprepared to handle. Call in mutual aid, gather additional resources and equipment to handle the situation, and keep your teammates safe. 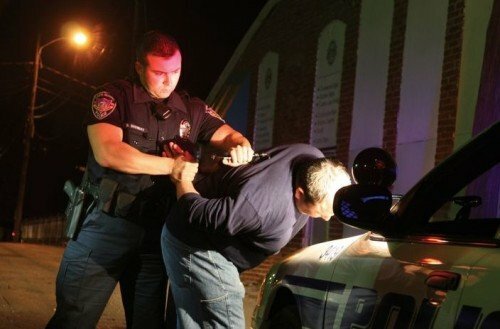 Instead of “Surprise” being taught as the sole companion of law enforcement, we must train our officers on the realities they may face on a mission. Murphy’s Law Applies – if it can go wrong, it will! Prepare for it, recognize it, and respond accordingly. Contingency planning should be a critical component of any tactical mission – whether on Patrol or by the SWAT Team. Even when events arise quickly, and must be acted upon quickly, someone in leadership needs to start planning on what to do when the event turns south and be ready with a plan to counter. Flash bangs do not guarantee Surprise, especially for a committed adversary deeper into a structure – bottom right (photo by kitup.military.com). Officers must have a working mastery of the OODA Loop and not just a textbook understanding. This is accomplished through days and weeks of force-on-force training (not hours), where officers can feel the effects of adrenaline, anxiety, physical exertion, and heavy breathing. As they become accustomed to these challenges, those effects are moved to the back burner while the officer is able to spend more energy analyzing their surroundings, recognizing shoot and no-shoot targets, and making more appropriate decisions. Officer Down and Officer Down Rescue – who, how, where to. 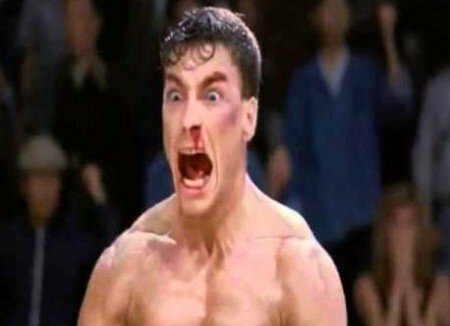 Finally, we must eliminate references to “Violence” from our terminology. The Courts and most of the public recognize that there are times police will have to use force to accomplish their lawful objectives. What is required of us legally and morally is to ensure that the use of force remains squarely inside Constitutional guidelines. Instead of pre-programming officers to carry out violence on anyone they confront, officers must be trained to evaluate the particular circumstances and use an appropriate level of force for the threat being confronted. Some control techniques may look harsh, but be perfectly reasonable once explained (photo from Pintrest). The level of force could range from clear verbal commands all the way to deadly force, but the justification is based upon the individualized circumstances being confronted and not upon a pre-arranged mission “plan”. Team Leaders cannot allow training concepts that do not conform to Constitutional requirements or best tactical practices to enter into the team’s core identity. When they do, teams inevitably fail! The results are lost team members through death, injury, or court action. In addition, the wake of such poor decision-making and supervision are dead, and injured civilians who should not have been harmed. The results can be criminal charges against officers, departments and officers liable for extensive damages, teams dismantled, officers demoted or reassigned, and lost careers. 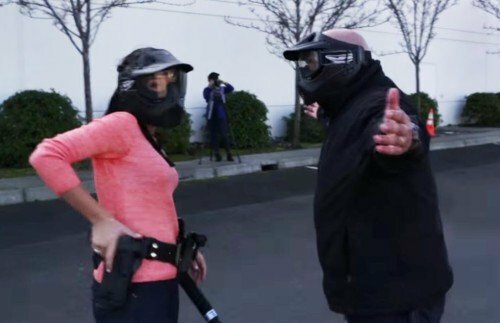 Appropriate force is not always clear, as seen by this civilian in police training grabbing her gun on an unarmed, unruly suspect. It is imperative for police to explain all the details of their actions (photo from YouTube.com). This series of articles comes at a time where public opinion of police is strained. The majority of Americans still support their police, but many of our decisions have caused divisions in opinion. The mass media has and will not do us any favors. The media feeds on misperceptions and hype, and we can expect no less. Despite these circumstances, this series was not presented as a touchy-feely, politically correct response to soften our tactics or approaches. On the contrary, my hopes and intentions are to strengthen our profession, ensure that we are thinking and acting in the best manner as possible, and removing hurdles that we have placed in our own paths. To accomplish this level of professionalism requires us to put our egos aside, and allow reason and sound tactics to lead our decision-making. The concept of this series is not to dismantle our tactics and make us more vulnerable, or to cave to some perceived political pressure. It is to recognize our individual and team strengths and weaknesses, so we can deliver services to the best of our abilities while not pushing beyond our capabilities. It is meant to encourage training at a much higher level, to open up dialogue on contingency planning and alternative methods of problem solving, to recognize we must master the OODA loop not just expect it to always work in our favor, and to expose the truth that “Speed, Surprise, and Violence of Action” is hurting us and not making us better. NTOA recognizes dynamic entry as the appropriate response to a hostage rescue. On all other actions a more deliberate entry movement should be used so officers can properly assess their surroundings and make sound judgements. The importance of this training doctrine is life and death – for the suspects and the officers.